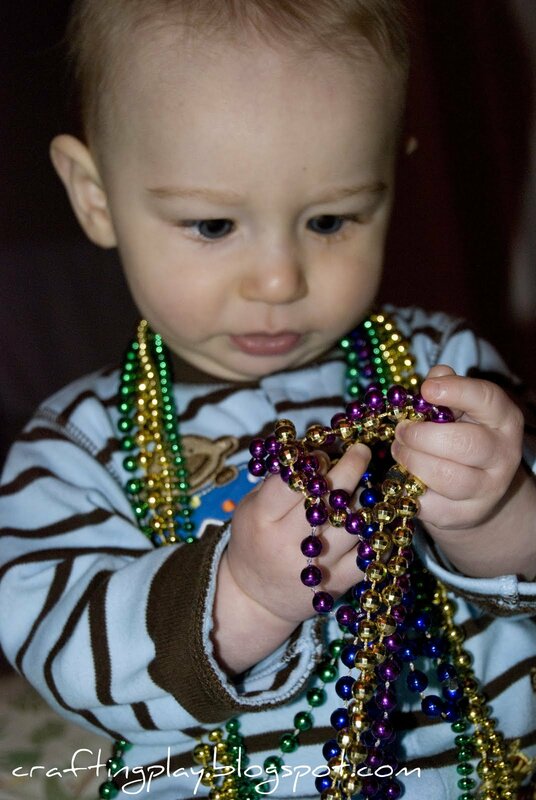 Filling and Spilling is a favorite activity for toddlers and is a great way to develop fine motor skills and hand-eye coordination. 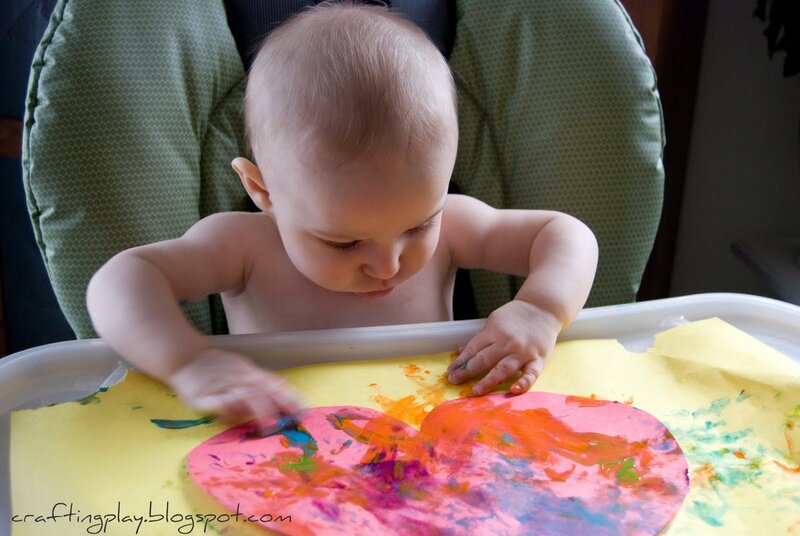 Many children begin being interested in fill and spill activities around age one. The best thing about fill and spill activities is that you can make them on the cheap. I am always looking for new "games" to make. They're especially great when Ethan needs to refocus his energy on a quiet activity that will hold his attention. Version 1- Pour pom-poms all over the floor. Fill the box. Dump. Repeat. You can also try calling out the names of the colors as you play. Version 2- Toddler rules. Let them make up their own game. Ethan created a game where he'd put the pom-pom on the edge of the box and nudge them in. Works for me. Version 3- Balance a pom-pom on a spoon and use the spoon to dump the pom-pom into the box. This is a great way to add an extra level of challenge to the game, as well as work on spoon skills. It was difficult for Ethan at first, but after I showed him to keep the spoon flat, he did have some success (and more and more with practice), and was proud of his accomplishment. Version 4- You hold the spoon. Toddler places the pom-pom on the spoon and helps you dump it into the box. Not as difficult as version 3, but still requires some extra fine motor skills. Ethan made up this version as well. What versions of the game can you come up with? This project is out of my archives, but it was a really enjoyable, and I never got around to posting it. I also think a pretty vibrant tissue collage like this is perfect for Mardi Gras! We made this collage when Ethan was 7 months old. I smeared glue stick all over the paper to make it sticky and sat it in front of Ethan. 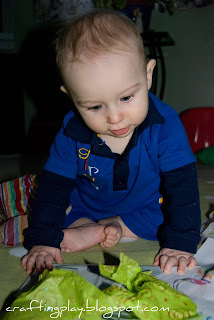 Then I gave him a variety of different tissue paper pieces, showed him how to tear the paper, and then just let him play. As the tissue pieces would fall to the paper, they would stick to the glue, and eventually, a collage was made! 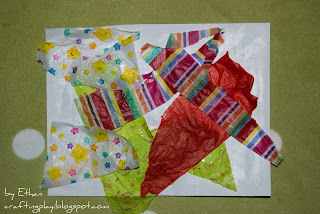 Playing with the tissue paper was a big hit, and the collage was bright and colorful when it was done. You could also do the same thing using Contact paper instead of paper and glue. For an infant, the glue worked great, although it would be much more messy if you were making a tissue collage with a toddler! 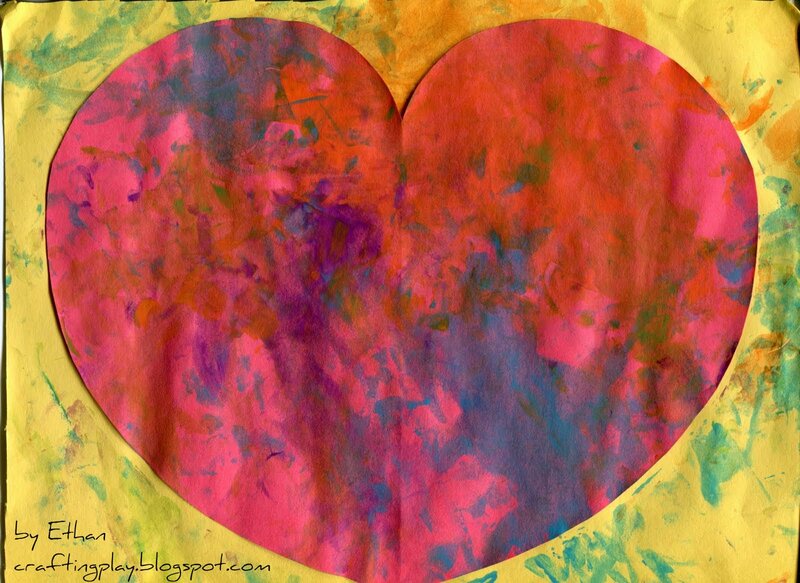 We used Contact paper when we made our Heart Collage. 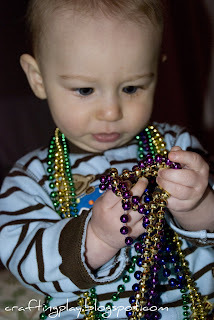 How are you celebrating Fat Tuesday and Mardi Gras with your infant or toddler? Hmmm, so I scheduled this post to go out last week, but just realized it never did. BUMMER!! Valentines day may be over, but these projects are still fun- and Mother's Day is just around the corner!! To prep the project, cut out a bunch of small paper hearts (Out of pure necessity, I actually cut mine out at work while I was on my lunch break- so whatever works!) and cut two pieces of Contact paper to the same size. Mine was approximately 8x6 inches. I created red and pink hearts, but I think it would also be real cool to cut some hearts out of newspaper as well. The white with black text would be a nice addition to the mix. Tape the Contact paper to the table (or we use our highchair try insert as a craft/art surface), sticky side up and let your kiddo start sticking the hearts to the surface. Ethan did a lot of moving the hearts around. When he got bored, we put the remaining heart in a box, dumped them all over the paper, and smacked them down. 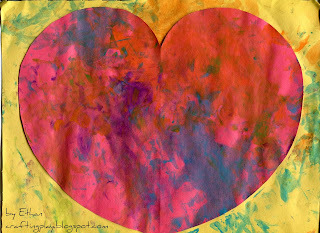 Finish by placing the other sheet of Contact paper on top to seal in the hearts. Looks pretty and festive hanging on our white cabinet, but it would look really cool hanging in a window too! Hope you enjoyed you special day! I've seen this technique all over Pinterest lately, and was really excited to give it a try! I think this project is a cool way to practice letter recognition, and is appropriate for both the infant and toddler crowd. Place the masking tape on the paint surface (I used a canvas board because I wanted the extra stability, and ease of removing the tape). Also, Ethan was surprised by the texture on the canvas, and thought it was pretty cool! You can purchase canvas board for $1-2 in the art department of your local art or craft store. 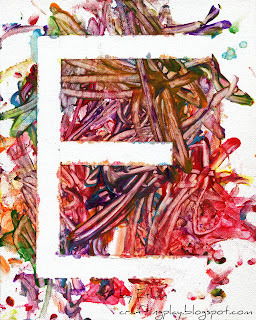 Then of course Ethan went to town painting. To add an bit of extra fun, I gave him Q-Tips to use (use your judgement as to when your child is ready to try this technique). He was very interested in the difference between a line painted with the Q-Tip and a line painted with his finger. On this particular day, he preferred the Q-tip. You can see he was very thoughtful about his painting! After the paint dried, I carefully removed the tape and hot glued a piece of ribbon on the back for hanging. Ethan now has a new personalized piece of artwork for his wall! 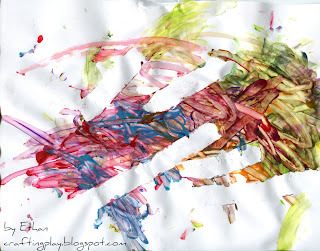 We also did an abstract painting using the same technique. This time, I tore off pieces of tape and let Ethan apply them to the paper. Of course, masking tape is a lot like stickers, so to a toddler, it was super fun! This time we just used printer paper, and I was surprised that the tape came off better than I expected. Makes for some great abstract artwork. How have you used making tape in a painting project? What about other methods for painting letters?